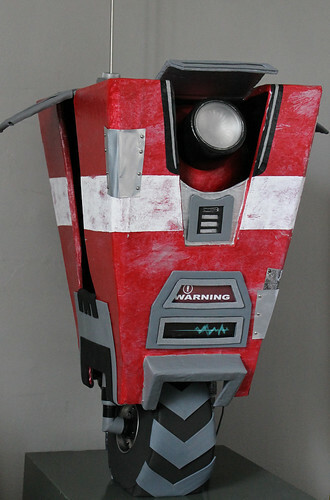 We're almost done Claptrap! He's just missing his arms and then he can start dancing. No, he won't actually dance, but he will have little speakers playing some of his catch phrases including "Hey, check me out everybody! I'm dancin', I'm dancin'!" For something that I told Chris would just be a weekend project, the card box has taken a lot of time, but I'm still really happy I decided to start work on it. I know there are more important wedding projects that need my attention, but it's the weird and wacky stuff like this that makes the whole process enjoyable. Of course, you might need to remind me that I wrote this when I'm stressing out the week before the wedding because none of the boring but necessary stuff was done far enough in advance. Speaking of more important projects, we're almost done designing the invitations! 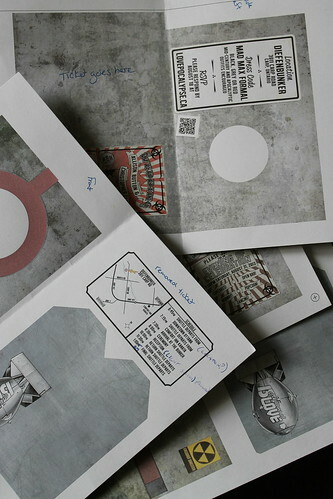 We've done some test prints and proofreading, and we should be starting to assemble them tomorrow.